Well, it’s already November so you know what that means!!! CITRINE! Citrine, along with topaz, is the November birthstone. Here at deBebians, we carry lots of citrine jewelry and it’s actually quite affordable. If you have somebody with a November birthday, look no further. We’ve got you covered. 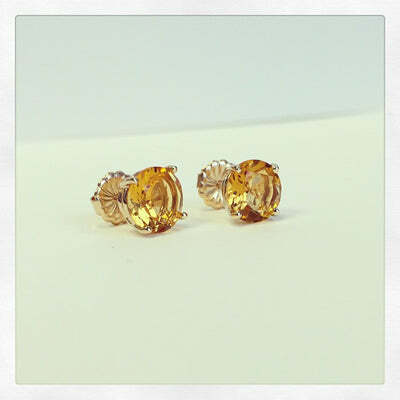 The citrine stud earrings are 5mm each and can be set into 14kt white or 14kt yellow gold. If they were for me, I’d choose 14kt yellow gold which would only help enhance the true color of the citrine gems. Currently priced at $160, these will not break the bank! Halo jewelry is everywhere these days! Take a look at this gorgeous cushion cut citrine set into a halo of white diamonds. This cushion cut citrine measures 6 x 6mm and will be 100% eye clean. I love the contrast of the white diamonds next to the gorgeous color of the citrine. 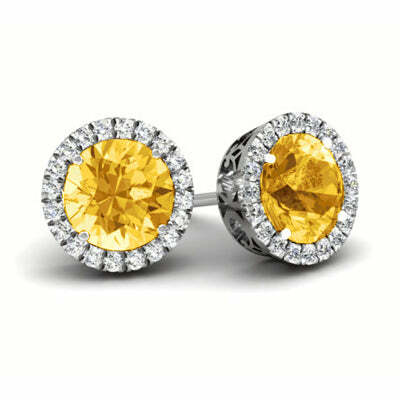 If you have a little more money to spend, be sure to check out these citrine and diamond halo earrings. These earrings will be something she can wear for years to come and really can be an everyday piece. The diamonds are hand set into these halos by our expert pave setter. You will be amazed at the quality of these citrine earrings! Birthstone jewelry can be hard to find and some of it can be a little dated looking. We have a gorgeous selection of birthstone jewelry, including November (citrine). If you need assistance, please do not hesitate to call on us! We can also customize any piece for you if you have something special in mind! Happy shopping!